Thanks to The Dukes of Hazzard, most Americans are familiar with the sleek, late-sixties Dodge Charger, but the General Lee was actually the second generation of Dodge’s sporty car; the first was the original Coronet-based fastback Charger, a peculiar-looking car born of desperation and bitter sibling rivalry. This is the story of the 1966-1967 Dodge Charger. Alfred P. Sloan, the chairman of General Motors from the early 1920s to the mid-1950s, was a great evangelist of what would later be called brand hierarchy. Sloan conceived a ladder of sharply defined automotive brands from the lowest price point to the highest. The idea was that buyers would signify their social and economic advancement by trading up, moving from a Chevrolet to an Oldsmobile and eventually to Cadillac, a philosophy has been embraced by nearly every other big-volume automaker. As many companies have discovered the hard way, maintaining such a brand hierarchy is challenging. Division managers, eager to improve their profits, try to poach sales from the divisions above and below them; corporate accountants push for more shared components between divisions, eroding the distinctions between models; and dealers, unwilling to be cut out of any potentially lucrative new niche, demand their own versions of every popular model. Before long, the carefully crafted brand ladder becomes a morass of nearly identical models, overlapping prices, and internecine warfare. The Chrysler Corporation was founded in 1923 by former GM executive Walter P. Chrysler out of the remnants of Maxwell-Chalmers. Chrysler was quick to establish his own hierarchy of brands; in 1928, the corporation launched the Plymouth and DeSoto divisions, covering the low- and medium-priced fields respectively. Around the same time Chrysler arranged to buy the Dodge Brothers Company, a well-established car and truck manufacturer. Dodge had been founded by John Francis and Horace Elgin Dodge in 1900 as a parts supplier, moving on to the manufacture of complete vehicles in 1914. The Dodge brothers died in 1920, leaving the company in the hands of a succession of other owners, although Dodge sold its one millionth car in 1924. The company was purchased by Chrysler on July 31, 1928, and officially became the Dodge Division of Chrysler Corporation in 1930, positioned above DeSoto and below Chrysler in price and prestige. 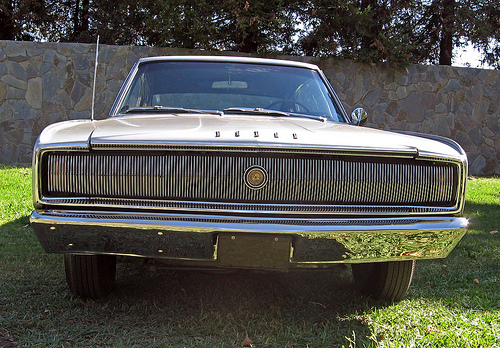 The front end of the 1966 Dodge Charger does not differ significantly from the Dodge Coronet on which it’s based save for the grille and hideaway headlights. Powered by electric motors, these were inevitably failure-prone and on some survivors have been locked in the open position. The relationship between Plymouth, DeSoto, and Dodge was always uneasy. During the Depression, Chrysler paired Plymouth with each of its other dealer franchises, insuring that dealers would all have a low-priced car to sell. This pairing helped keep many dealers alive, but forced Plymouth to always play second fiddle to its corporate siblings in power, features, and styling, lest it overshadow the more expensive cars on the other side of the showroom. That in turn put Plymouth at a disadvantage against Chevrolet and Ford, its principal rivals. DeSoto died in the early sixties, leaving Dodge to cover the mid-priced spread between Plymouth and Chrysler. By then, Plymouth was paired only with Chrysler, leaving most Dodge dealers as stand-alone franchises. Although in theory this move gave the two brands greater autonomy, it also provoked a sometimes bitter rivalry. Dodge’s nominal competition was Mercury, Pontiac, and Oldsmobile, but Dodge management envied Plymouth’s greater sales volume, which typically exceeded Dodge’s by 50% or more. Cannibalization — having one brand steal sales from another — had been a problem for Chrysler since the mid-fifties and had been a major factor in the demise of DeSoto. GM’s automotive divisions competed with each other too, particularly the mid-priced brands, but GM’s total market share was enormous and its pockets deep, allowing a high level of stylistic and mechanical differentiation. Chrysler couldn’t afford that — unlike, say, Chevrolet and Oldsmobile, Plymouth and Dodge cars were nearly identical under the skin– which left its remaining brands in considerable danger of undermining each other rather than expanding the company’s share of the domestic market. Nonetheless, any time Plymouth had a popular or even promising new product, Dodge demanded and generally got its own version, usually close enough in price to represent direct competition for the Plymouth version, but with a somewhat higher grade of trim or more features. As far as the corporation was concerned, having Dodge directly target Plymouth was bad news, but neither dealers nor division executives could be dissuaded and the sibling warfare continued. Another 1966 Dodge Charger shows off its headlamps in their closed position. The lamps were carried on a rotating panel whose closed side had fake grille bars to blend into the surrounding nose. Hidden headlights were used on 1942 DeSoto models, but the fastback Charger was the first Chrysler product to use them since the war. In the fifties, each division had had one basic product, offered in several body styles and trim levels, but by the mid-sixties, buyers were demanding a choice between compact, intermediate, and full-size models and there had been explosive growth in the ‘specialty car’ segment: cars like the Ford Thunderbird. Chrysler was even slower than GM to enter the specialty car arena. The corporation had previously offered a few limited-edition performance models, like the big Chrysler 300 “letter-series” cars and the original Plymouth Fury, but they were relatively rare and by the early sixties, Chrysler had let them become watered down to the point of invisibility. Furthermore, unlike the Thunderbird, none of them offered a unique body. In 1962, Plymouth designer Milt Antonick developed a fastback hardtop coupe based on the second-generation, A-body Valiant. Dubbed “Barracuda,” it received production approval in early 1963 for a spring 1964 introduction. The A-body Barracuda was intended as a follow-on to the Valiant Signet hardtop, a rival for both the Chevrolet Corvair Monza and the upcoming Ford Mustang, which was set to debut in April 1964. As had become inevitable, no sooner had the Barracuda been approved for production than Dodge dealers began lobbying for their own version. For once, however, neither Dodge management nor Chrysler president Lynn Townsend was thrilled with the idea of cloning the Barracuda. At that time, many Detroit executives, including Dodge general manager Byron Nichols, expected the Mustang to be a niche item and were concerned that that niche would be quickly over-saturated. By contrast, Nichols saw an untapped market for a bigger specialty car, one that might snare both Mustang and Thunderbird buyers without directly competing with both. Dodge was then preparing to introduce the plush Monaco, a fancier version of the division’s C-body full-size hardtop aimed at the Pontiac Grand Prix and Oldsmobile Starfire, but that still left room for a distinctive specialty car based on the B-body intermediate line. In the summer of 1963, Dodge stylist Carl Cameron did a series of design studies for a midsize fastback coupe based on the next-generation B-body Coronet. Cameron’s design, at least one iteration of which was dubbed “Monte Carlo,” was intended to look as different as possible from the standard Coronet while sharing most of its unitized body structure and hardware. As Cameron’s design was taking shape, the industry was discovering that its previous doubts about the Mustang’s commercial viability were ill-founded. The Mustang, which debuted on April 17, was a smash hit; indeed, in its extended first model year, it would sell 680,992 units, exceeding the Dodge Division’s entire output by more than 200,000 units. Naturally, Dodge dealers renewed their cry for a Mustang-fighter of their own. In 1966, the fastback Dodge Charger offered five engine choices, all V8s: the base 318 cu. in. (5,204 cc) engine with 230 hp (172 kW); the 361-2bbl (5,913 cc) with 265 hp (198 kW), a $87.75 option; the 383-4bbl (6,276 cc) with 325 hp (242 kW), a $149.60 option; and the 426 Hemi (6,974 cc) with 425 gross hp (317 kW), priced at a whopping $877.55. The latter was very rare, with only 468 sold. It was already apparent that the Plymouth Barracuda was not the answer. Although it debuted two weeks before the Mustang, the Barracuda’s first-year sales totaled a dismal 23,443, a fraction of the massive success of its rival from Dearborn. In the summer of 1964, Lynn Townsend gave Dodge product planning manager Burton H. Bouwkamp the go-ahead to develop a Dodge sporty car, but said emphatically that it should not be based on the A-body; a Dodge version of the Barracuda would help no one and threaten the Mustang not at all. The expedient answer was Carl Cameron’s fastback Coronet. The exterior design of the fastback B-body had been largely finalized by the fall of 1963, but there were still various unresolved detailing, packaging, and structural questions, such as whether the fastback should be a hardtop or have fixed B-pillars. According to Car and Driver, Dodge attempted to fast-track the development process in hopes of launching the fastback as a 1965 model, months ahead of its redesigned B-body rivals, but that proved impossible. The best Dodge could manage was to created a show car version of the fastback, dubbed “Charger II” (implying a sequel to the 1964 Charger concept car that had showcased the revived Hemi engine), which was exhibited at the Chicago Auto Show in the spring of 1965. Dodge’s public relations staff indicated that the Charger II was intended to test public reaction to the design and implied that a favorable response would make Dodge consider building a production version. In fact, the fastback was already committed to production and Dodge engineers were scrambling to get it ready. As it turned out, the production Dodge Charger did not debut until January 1966, almost a year later than the division had originally hoped. Unsurprisingly, the production car looked very much like the Charger II, differing mainly in small trim details. From a structural and mechanical standpoint, the 1966 Charger was little more than a V8 Coronet with a new roof, but it was dressed up with an ‘electric razor’ grille with concealed headlights and a unique rear clip with full-width taillights. More impressive was the Charger’s unique and expensive interior treatment, which featured round pods with a full set of gauges (including a tachometer, for once not mounted on the floor), bucket seats both front and rear, and an elongated center console. 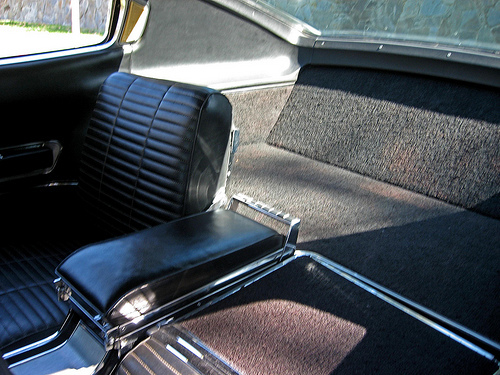 Like the Barracuda, the Charger’s rear seats folded flat to increase cargo capacity, a novelty at the time. 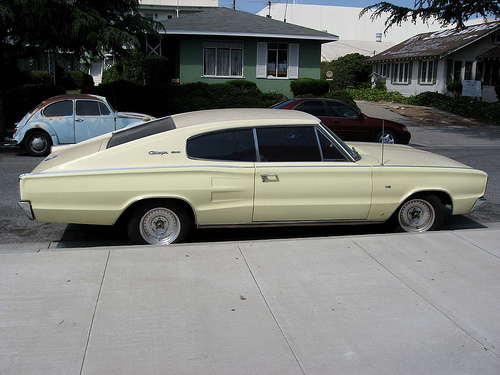 For all that, the Charger still looked a lot like a Coronet or AMC’s conceptually similar Rambler Marlin. However, the Charger was substantially more expensive than either; the $3,122 base price put the 1966 Charger into the same realm as Pontiac’s Tempest GTO, but was $417 more than a Coronet 500 hardtop with the same engine, a hefty premium at that time. Most of the price differential between a Coronet and a 1966 Dodge Charger can be found here: full instrumentation, including a tachometer; folding bucket seats front and rear; a full-length console with a floor-mounted shifter; and a vast array of shiny chrome and stainless-steel trim. The rear seats, which can fold either individually or together (the console flips forward as well), make for a versatile cargo hold, if not a huge amount of space given the exterior dimensions. 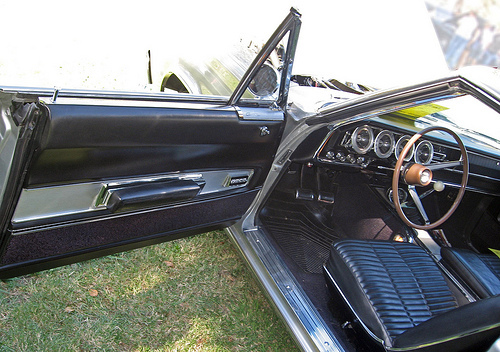 The 1966 Dodge Charger is 203.6 inches (5,171 mm) long on a 117-inch (2,972mm) wheelbase. Thanks to its new roof and its associated structural reinforcements, the Charger weighed about 175 pounds (80 kg) more than a comparably engined Dodge Coronet. With the 426 Hemi and TorqueFlite, the Charger’s curb weight was a hefty 4,160 pounds (1,887 kg). The fastback Charger had at least one big advantage over the Marlin and that was the Dodge’s running gear. AMC had little that could be considered sporting hardware; its most powerful engine had only 280 gross horsepower (209 kW), which made for something less than scintillating performance. Dodge, however, had torsion-bar front suspension, the excellent TorqueFlite automatic transmission, and a full assortment of engines, including the 426 Hemi. The origins of Chrysler’s 1951 FirePower Hemi engines are a story for another day, but suffice it to say that they had been powerful, heavy, and expensive to produce. They were dropped in 1958 in favor of a cheaper, wedge-head “B” engine, which became Chrysler’s bread-and-butter big V8. The B/RB engine was relatively tame in street form, but, expanded to 413 cu. in. (6,771 cc) and then 426 cu. in. (6,974 cc), became the basis of the legendary “Max Wedge” engines, which were used extensively in competition. 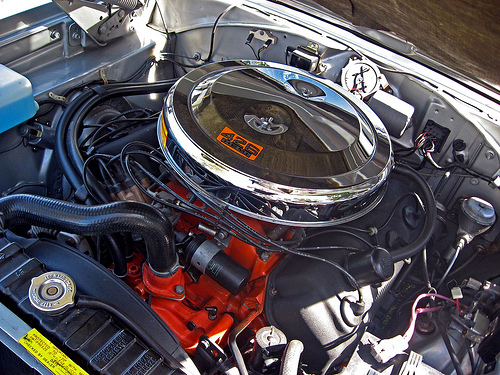 By 1963, the wedge had reached the limits of its development, so far as racing was concerned, so Chrysler revived the old hemi-head design on a beefed-up 426 block for use in NASCAR. It was triumphant in 1964, but NASCAR chief Bill France kiboshed the Hemi for 1965, saying it wasn’t really a stock production engine. Chrysler retreated from the tracks for a season and then offered a street version of the Hemi — not just to special customers, but to anyone who could pay for it. The mightiest engine available from Chrysler in the late sixties — and one of the most powerful street engines offered in any street car until quite recently — was the 426 Hemi. Only 468 fastback Chargers were sold with these ferocious engines in 1966; this is one of them. The Hemi was expensive: in a 1966 Dodge Charger, it cost about $880, and it reduced Chrysler’s normal five-year/50,000-mile (80,500-km) warranty to 12 months and 12,000 miles (19,320 km). However, a well-tuned Hemi Charger was capable of going from 0 to 60 mph (0 to 97 km/h) in a shade over 6 seconds and running the standing quarter mile in the low 14s with a trap speed of over 100 mph. This was enough to blow the doors off a GTO and would eat any stock Mustang alive. The Hemi never sold in large numbers and Chrysler undoubtedly lost money on most of the ones they did sell, but its image value was tremendous. 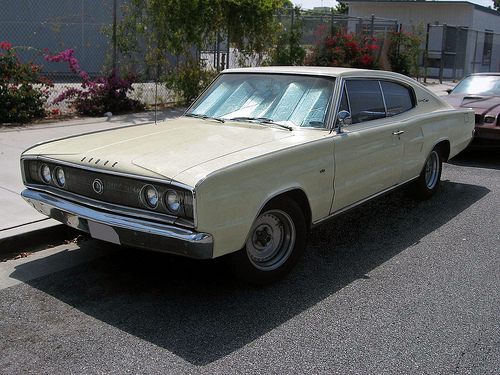 The simulated venturis in the side molding were another tacked-on feature that differentiated the Dodge Charger from the cheaper Coronet, at least in 1966; Coronets adopted the same motif for 1967. This 1966 Charger probably has the 383 cu. in. (6,276 cc) engine, which provided more than adequate performance — 0-60 mph (0-97 km/h) in about 7.8 seconds, the standing quarter mile (402 meters) in the mid-16s. The standard 318 cu. in. (5,204 cc) and optional two-barrel 361 cu. in. (5,913 cc) engines were somewhat sluggish in this heavy car. Unfortunately, the fastback Charger, Hemi or no, found little success on the track. While its fastback roof created less drag than a notchback Coronet, it essentially turned the body into a giant wing, generating enough lift to make the tires’ relationship with the pavement at high speeds very tenuous. This was not a major problem in on-road use — by mid-sixties standards, the Charger handled pretty well — but became a white-knuckle affair at 150+ mph (240+ km/h), making it hard for racing drivers to exploit the Charger’s speed potential. The fastback Dodge Charger’s full-width taillights contain six separate bulbs for brake lights and turn signals. Designer Carl Cameron originally wanted the turn signals to be sequential, like the contemporary Ford Thunderbird, but that feature was deemed too expensive. 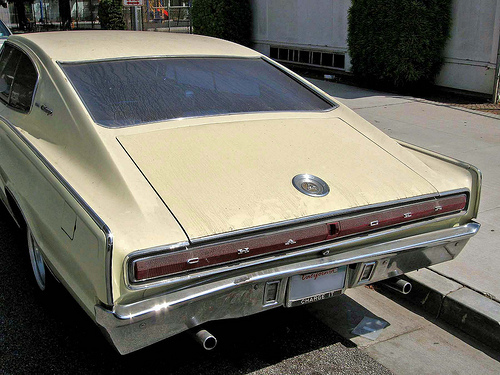 The Charger’s tail was aerodynamically slick, but it exacerbated the problem of lift at high speeds. 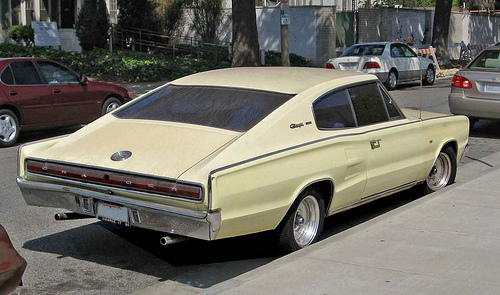 1967 Dodge Chargers could be had with a tiny rear spoiler on the decklid, which helped a little. Racing success might have helped sales of the street cars, which were disappointing. Dodge sold 37,300 in 1966 (only 468 of which had the Hemi) and sales plummeted more than 50% the following year despite the addition of a new 440 cu. in. (7,206 cc) V-8, which offered comparable street performance to the Hemi for less than half the cost. Whatever its performance, the Charger was clearly no sales threat to the GTO or the Mustang. Why was the fastback Charger a commercial flop? The odd styling probably had a lot to do with it, but we suspect the bigger problem was that for all Dodge’s efforts to give the Charger a racy image, it had no real-world performance advantage over its Coronet and Plymouth Satellite siblings, which were lighter and cheaper. At the same time, the Charger was probably a little too sporty to appeal to personal-luxury buyers. In Bouwkamp’s position, a GM exec might’ve killed the model entirely after that, but Dodge was not about to relinquish their one foothold in the specialty market. The Charger got a sleek restyling for 1968 with flying-buttress sail panels like those of the 1966-1967 GM A-body hardtops; the result was a much more attractive car that sold much better. Dodge sold 96,108 Chargers in 1968, enough to finally put some hurt on the GTO if not the Mustang. The Charger’s revamped styling, unlike the original, has stood the test of time to become a classic of its era. Even before the second-generation Charger debuted, Dodge was already working on its Mustang rival, the E-body Challenger, which would share its body shell with the third-generation Plymouth Barracuda. 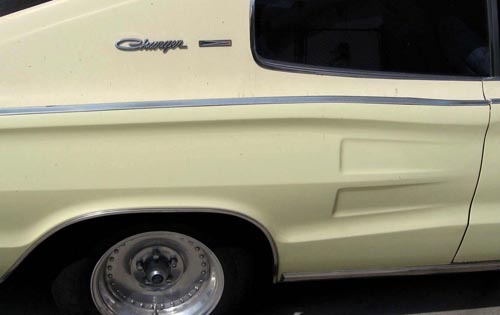 When the E-body arrived for 1970, however, the market for sporty cars was already withering on the vine and the Challenger only served — as Lynn Townsend had predicted five years earlier — to erode the already modest sales of the Barracuda. Both cars died after 1974. 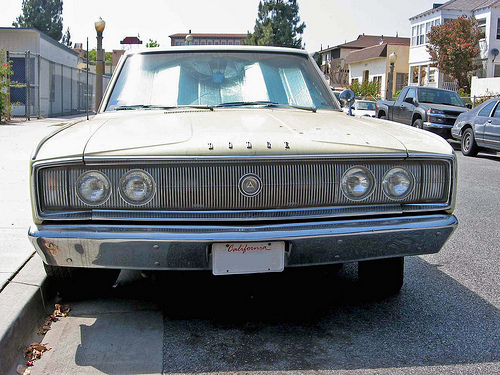 The sibling rivalry between Dodge and Plymouth went on throughout the sixties and seventies. When Plymouth had an unexpected hit in 1968 with the Road Runner, a stripped-down, high-performance Belvedere intermediate, Dodge followed with the Coronet Super Bee. When Plymouth turned the Valiant into a surprisingly popular fastback coupe called Duster, Dodge was close behind with the Dodge Dart Demon. By the eighties, a cash-strapped Chrysler had largely stopped trying to differentiate the two brands except in equipment levels and very minor cosmetic and trim details. Given what came after, the original fastback Charger looks better in retrospect than it did at the time. If it was hastily contrived and somewhat awkward, it was at least unique — not a rebadged Plymouth with a Dart grille, which it just as easily might have been. Still, if Dodge had spent more of its resources studying where the market was going rather than competing with its sister division(s), it might have endured the coming decades much better than it did. Our sources on the development of the Charger included the Auto Editors of Consumer Guide, “1966-1967 Dodge Charger,” HowStuffWorks.com, 16 October 2007, auto.howstuffworks. com/ 1966-1967-dodge-charger.htm, accessed 24 February 2010, and Encyclopedia of American Cars: Over 65 Years of Automotive History (Lincolnwood, IL: Publications International, 1996); Burt Bouwkamp’s July 2004 speech, “The Birth and Death of the (Original) Dodge Charger,” transcribed at Allpar.com, 2006, www.allpar. com, accessed 2 June 2007; Arch Brown, “1965 Plymouth Barracuda,” Special Interest Autos #82 (July-August 1984), reprinted in The Hemmings Book of Plymouths: driveReports from Special Interest Autos magazine, eds. Terry Ehrich and Richard A. Lentinello (Bennington, VT: Hemmings Motor News, 2002), pp. 102-109; James M. Flammang and the Auto Editors of Consumer Guide, Chrysler Chronicle: An Illustrated History of Chrysler – DeSoto – Dodge – Eagle – Imperial – Jeep – Plymouth (Lincolnwood, IL: Publications International Ltd., 1998); John Gunnell, ed., Standard Catalog of American Cars 1946-1975, rev. 4th ed. (Iola, WI: Krause Publications, 2002); John Katz, “1967 Dodge Coronet R/T: Much More than a Plymouth,” Special Interest Autos #156 (November-December 1996); Richard Langworth, Chrysler & Imperial 1946-1975: The Classic Postwar Years (Osceola, WI: Motorbooks International, 1993); Curtis Redgap, “Insider’s History of Plymouth,” Allpar, c. 2003, www.allpar. com, accessed 2 June 2007; and Josiah Work, “Fantastic Fastback: 1966 Dodge Hemi-Charger,” Special Interest Autos #111 (May-June 1989), both of which are reprinted in The Hemmings Motor News Book of Chrysler Performance Cars: driveReports from Special Interest Autos magazine, eds. Terry Ehrich and Richard A. Lentinello (Bennington, VT: Hemmings Motor News, 2000); and Paul Zazarine, Barracuda and Challenger (Muscle Car Color History) (Osceola, WI: Motorbooks International, 1991). We also consulted John Ethridge, “Dodge’s Charging Charger” and “Evolution of a Show Car,” Motor Trend Vol. 18, No. 1 (January 1966), pp. 24-31; “Specialty: Dodge Charger,” Motor Trend Vol. 18, No. 11 (November 1966), p. 46; Bob Schilling, “Sporty Specialties: Marlin Charger,” Motor Trend Vol. 19, No. 5 (May 1967), pp. 38-40; “Sporty Cars,” ibid, pp. 41-42; John Etheridge, “Dodge Monaco Road Test,” Motor Trend Vol. 17, No. 4 (April 1965); Eric Dahlquist, “How Hot Is the Hemi?” Hot Rod December 1965; “Dodge: Monaco, Coronet, Polara, Dart,” Auto Topics November 1965; “Dodge Charger: Detroit’s latest fastback is a neat package of proven components, but the best of Charger is yet to come!” Car and Driver February 1966; “Cars Road Test: Dodge 426 Hemi Charger,” Cars March 1967; John Ethridge, “Dodge’s Dreadnoughts,” Motor Trend Vol. 19, No. 6 (June 1967), which are reprinted in Dodge Muscle Portfolio 1964-1971, ed. R.M. Clarke (Cobham, England: Brooklands Books Ltd., ca. 2003; and “Hemi/Charger: Dodge’s Fastback Fullback Plays Offense and Defense,” Car Life February 1967, reprinted in Dodge Muscle Cars 1967-1970, ed. R.M. Clarke (Cobham, England: Brooklands Books Ltd., ca. 1984). I have a 66 charger,with a 361 engine. It has matching numbers,transmition ,all original,there were about 5000 361 engines put in these cars. How rare, and what would the value be for a restored one? I also have clock on console,the certified card,and the original owners manuel, with matching numbers stamped on it.she needs bodywork,but I intend to keep everything original. I think these cars are beautiful,and I”am very proud to own one,This is my fourth charger,since 1979,I saw my very first one in 1975, a black hemi 66 charger,I have been upsest with these cars since that day,when you see one go by,once in a blue moon, they are really a head turnner.Would like a response,Thank you. I’m afraid I don’t have any particularly useful information on valuing your car. They’re relatively rare at this point — the usual rule of thumb, except with Classics, is to assume a survival rate of about 1%, which would imply roughly 4,000 surviving ’66s. The downside is that the first-generation Charger has never been as sought after as the ’68-’70 model, and unless it has a Hemi or the 440 (offered only in ’67, and very, very rare), its collector value is more modest. The 361 is not the most desirable engine, which would make it somewhat less valuable, as well. I know it’s not very helpful, but a current collector car price guide could probably help you more than I. Sorry! I don’t think the first gen Charger is awkward at all – I find it beautiful. The Marlin did look awkward from the side, but was beautiful from every other angle. The Charger looks good from any view. I agree with you 100 persent,i to think the 66 and 67 chargers are beautifull, iam a proud owner of a 66 charger,all original with original 361 engine,and the original owners manual,and certicard that came with the car,only 5000 66 chargers got the 361 atomatic,and only 500 with the standerd transmission! with all the clones that are on the road today and all the plastic that goes with them,if your lucky enough to see a restored 66 or 67 go by,they stick out like a sore thumb!and really are a head turnner! i love my 66 charger,there is no car like it,nor will there ever be,its a true classic! I love my 66 charger for it is a surviver too ! I have had it for 12+ year’s and alway’s get asked if I will sale it. I won’t sale.I will pass it on in the family or my wife when I pass.I had a 383 cu.in. auto.tran’s 8 3/4 limited slip rear end. hi jerry,i own a 66 charger two,and i always call her she when i talk to other people about her,mine has a 361 engine,all original with original owners manual,and original certicard that came with the car,this is my fourth 66 charger i have owned since 1979,but this one was all matching numbers,mine is metelic red with metelic red interior,what coler is yours? i adore mine two,e mail me if you want and we can talk about my favorate subject,66 CHARGERS! 1967 Dodge Charger (Larger Charger) looking for information. Car has only been owned by 2 parties, original owner off of showroom floor, then mechanic purchased it. Car has been in the garage for 25 years. New motor (440+6) has only 350 miles. Have original parts and numerous other parts. Just seeing if there is an interest for purchase. I own a 66 Charger 383, 4bbl, A/T, PS, A/C,53k miles, numbers matching. Purchased 1978 from 2nd owner with 39k documented miles. Have certicard and owners manual. Headlights open and close perfectly. Everything else does also. It’s black with burgundy interior. I saw my first Charger in Feb of 1966 and thought it was fantastic. I still feel that way and agree, they are definitely head turners. Very nice — from a real-world standpoint, that’s probably about the optimal first-generation Charger equipment package. (Obviously, a Hemi with four-speed is worth more, but a 383/4V and TorqueFlite is easier to live with.) The burgundy exterior is very attractive as well. just a up date,my 66 charger with original 361 engine,and matching numbers,with original certi card and owners manual,will be going in the body shop in the spring,i can hardly wait, long live the 66 and 67 chargers!! I’ve had a couple of 66 chargers. Love the electro-luminescent dash board, 250Hz, 250V, breathtaking display around the 150MPH dash, 4 bucket seats, console, etc. My issue is, other than the safety short-falls that many if not all 66 cars had, is the front end of the 383 and larger motor chargers is just way too heavy. Fun for cruising, looks great, but that short fall takes it out of contending. Straight line OK, but any kind of curve and the rear end swings around like a rabid Zamboni, with the point of inertia too far forward. Something they adjusted in later models. They also improved the roll-over head lights. in 66 & 67 the entire headlight assemblies revolved 180 degrees on what looks like a starter motor, one for each side. In later models a door was lifted (or closed) in front of the head lights, as moving headlamps often had issues with alignment, although the look was impressive if not classic Chrysler over-kill. my dad and I own a 1966 charger with a 318 poly auto with mauve ext. black and white int. our production date is Oct. 25th 1965. Does anyone know when the first 66 was produced?